Today, SuperFastBusiness takes on a topic not often discussed, inviting eight-figure business co-owner Buck Rizvi to share how he built such a large business and what makes it work. 02:46 – Why eight figures? 31:03 – How important is a list? James: James Schramko here, welcome to SuperFastBusiness.com. Today we’re going into a pretty heady topic of eight-figure business sort of stuff. It’s not a topic that is discussed that often on this show. I’m sure that most of the listener base for SuperFastBusiness.com will be somewhere in the five, six and seven region. There’s a few eight-figure marketers that I am aware of, and hey, there may be some lurkers, but it is a business realm that’s just not that common, you’re not likely to bump into so many when you’re down at the local coffee shop. So I brought in an expert to talk about this topic. I’d like to welcome to the call Buck Rizvi. Buck: Hey, James, how are you? Thanks for having me. James: Doing well. Now we have known each other for quite some time, which is good, and I’ve been able to observe your activities from the sidelines. Buck: And I’ve noticed that you’re a pretty good driver. James: Yeah, well, both of us are alive, which is a positive. James: Having been in adventures driving across deserts and avoiding cacti and Mexicans and cattle. Buck: And you still invited me to this podcast, so I don’t know. James: You know, it’s sort of one of those bonding things. James: Now, as you know, you can’t build a big business like an eight-figure business all by yourself, and that’s why we have stayed in touch over these years. We have a little network of people who we talk with and share ideas. And some of the high-level discussions that are talked about in small groups behind closed doors when you get these seven- and eight-figure business owners, probably even some nine business owners, the discussion’s slightly different discussions than what you’re having in your sort of entry-level forums where people are trying to figure out how to make a landing page and how to connect an autoresponder, you know, which website platform to use. You’re talking a much different type of discussion, and we’re going to touch on a couple of these today. I think there are probably three main areas that we might cover, and I’ll start off with one. Firstly, why would we even want an eight-figure business? What’s the mindset happening here? Buck: Well, I never heard it presented that way, that type of question. Why would you want one? You know, for us, it wasn’t like we went into this business – I have two business partners in my company, RealDose Nutrition, and we didn’t go into it thinking, hey, how quickly can we hit eight figures? It was more, there was a market that we identified, we’re in the health niche, selling dietary supplements online, felt that that was a growing market, we knew that that was a multi-billion dollar market, I think it’s going to be a 60 billion dollar opportunity in the next couple of years here. And so we were in the slipstream of something that was already big, and that we just wanted to carve out our piece of it. So in a sense, it was a bit accidental. I’ve had some experience in online marketing and success previously in building a seven-figure dietary supplement business, but I would like to say we hit the motherlode, and it created its own series of problems and exciting bits as well. So I’d be happy to cover some of the problems so people can avoid them on this call. James: Well, you know, when I think of an eight-figure business, I might be coming from a different perspective but there are a few aspects there. Because a lot of the focus I’ve had lately is to run a seven-figure business that allows me to actually still live, you know? James: Some of the aspects that I like about my business are that I don’t actually have any physical stock. I don’t do a lot of paid or high-leverage campaigns or launches, and I don’t have an office with staff in it anywhere, but there is a virtual team, and I know this is going to come up in our discussion, because you can’t do it by yourself. We have good margin, and it’s pretty much just me running the thing. So I look at, then, would I want to be doing a supplement business? So I think there’s definitely got to be drivers to make this work because if I wanted one, I could probably figure out how to do it or learn from someone like you. So I want to know what we’re actually talking about here. We really need to know, what are the mechanics? Buck: Hold on, James, are you dissing my whole business model right now, in the last 60 seconds? James: No, I am saying let’s be real here, that you got to be careful what you wish for, because you might just get it, and I don’t think everyone’s going to be suited for an eight-figure business. What do you think? Buck: No, I would agree with that. And I would also agree with the notion that there’s a lot of simplicity in not having physical products to worry about, right? It is a very different world. I think something…. James: I think you have a foot in both worlds, do you not? Buck: We do, to a degree. I mean we have some virtual goods that we bundle with our products, but by and large it’s a physical business. James: But you also have an education teaching people how to build their own eight-figure business, or their health business, correct? James: So you’ve got a site called HealthProfitsAcademy.com, and that side of the business sounds a lot to me more like it’s information based. Buck: It definitely is information based, and the mission behind HealthProfitsAcademy is really focused on addressing a number of problems I’ve witnessed in the last 10 years of doing supplements that I think by creating an ecosystem of partners of teaching people how to get into this business the right way and build big businesses the right way, that we can do some great things together and also be in a coopetition kind of environment; so that’s part of the mission statement of HealthProfitsAcademy is building ethical health businesses and doing it the right way. James: Nice. Well, I’m glad that there’s ethics involved. It’s a very interesting market. I think even Timothy Ferriss had a start in this type of industry. I think he references it in his 4 Hour Work Week; his first business that went quite well was in that industry. Buck: He did, I think it was $40,000 a month, selling a dietary supplement for the brain, you know, focus market, mental focus. James: Right. So there are some good reasons why you might want to look at having a health business that’s quite large. Is it possible to do health businesses on a small scale, or is it really only worth doing it big? Buck: Oh, absolutely. I have students that are happy doing $10,000 a month in sales. They’ve got a six-figure business, and they’re just sort of happily chugging along. They definitely would like to scale that business, but they’re happy where they are. You know, you talk about the headaches of running a larger business. The flip side of that and one of the unique things about the dietary supplement business in particular is that this is the type of business that you can sell the same product to the same customer over and over and over again and they will smile and happily hand you their money. So that is unlike other types of businesses where you have to produce new content, whether it’s a new e-book, a new recording, a new video or what have you in the digital world, where if you’re selling a building or a car or something like that, the frequency of purchase, the expectation, it’s a consumable product, all those things lend themselves very well to make this a very profitable type of business. Couple that with the fact that the market is growing substantially, and has been for the last 10 years. James: That is a winner. It sounds like Richard Koch’s Star Principle, picking booming markets and you have a strong company within it. The recurring aspect, I can’t ignore that. I think that’s my number one passion, is finding something that has automatic re-bills. Because if we look at our profit formula of traffic times conversions times dollar amount times frequency times margin, the frequency thing is a big one, isn’t it? Buck: Yeah, very much so. James: I’m a huge fan of the subscription model. I think that’s a great start. So you’ve picked a good industry, that’s growing, where you can actually help people. I imagine some of these products are useful for people to consume and have some benefits. Buck: Well, there’s a problem with that, that’s one of the issues with the dietary supplement business, there’s a lot of snake oil salesmen in there doing the wrong things, selling crap or selling products that potentially can hurt people. There was an interesting New York Times article today. I think it was the New York Attorney General was going after Target or Walgreens about products that did not contain the right ingredients, did not contain what was on the label. James: Oh, that’s a serious issue, isn’t it? James: I guess I’m probably a little bit skeptical, but when I see outrageous claims I can’t help but start researching and finding all the counter-claims. There is a huge amount of money moving around for worthless things. So how do you make sure that your product is actually useful? Buck: Well, we, and this is part of what my students go through in HealthProfitsAcademy is there’s a very discrete set of steps that we go through to make sure… A, it starts with the whole premise, the core value that you have, is you’re going to produce products that are backed by human clinical studies that are going to contain the same ingredients as used in the studies at the same dosage levels. If you don’t do that at a minimum, then you’re really fooling the public. You’re making improper claims. So there are great ingredients that are in some cases patented, trademarked, that have the gold standard, you know, double blind, placebo-controlled studies that have been conducted on them, that actually do what they say they do, whether it’s for weight loss, for memory, for joint pain, or what have you, right? So they’re as effective, and in some cases, more effective than taking a pharmaceutical drug without all the side effects. The downside is, plenty of folks will take that research or borrow that research and claim that they have the same ingredient, or they have a generic version of the ingredient, and they wind up not delivering the same benefit. James: Yeah, I went to visit a customer in Australia who had quite a premier supplement company, been around for a long time, a family sort of business, and then they were complaining to me about one of their competitors, who was really more of a marketing business. They put most of their money into endorsements of athletes, and then they replicate the products and come up with this almost new brand, that is taking huge market share. I imagine it must be a highly competitive industry. Buck: Well it is, but I think that people of a certain age, I typically sell to the baby boomer market, and people born between 1945 and 1964, and it’s a massive, massive group of folks, I think it’s over 70 million people, and they’re becoming savvier now. There are more tools available for them to research and figure out what’s working, what’s not working. They can do their homework on brands, and make sure that they have good reputation, that customers are getting the expected outcomes. But unfortunately that doesn’t stop the bad actors from going in there and trying to take advantage of people, unfortunately. So we go the extra mile to make sure that we do third party testing on our products, we reference the clinical studies that have been performed on the ingredients, the exact same ingredients that we include in our products, and this is what we go through in the HealthProfitsAcademy training program. It sounds difficult, but it really isn’t. There are companies that you can work with that source these ingredients, distributors of them that you can work with, some have been around for decades, they’re trustworthy, and you can get quality differentiated formulas that actually work, formulated into market in a relatively short period of time. James: OK, now let’s just take a big snapshot here. So far, we’ve uncovered a few gems that you want to be looking for a scalable market with huge growth. You want to be looking for something that the product gets consumed, so that it’s recurring in nature. James: You want to have a really good product, you’ve given us some criteria there in your industry, how you can tell what that is, which is great. When the business is running well, are there benchmarks for how profitable they should be in terms of percentage of revenue? Buck: Yeah. I think a good target is 20% or greater, net. James: So it sounds like an e-commerce sort of metric. Buck: You know, the front end, some companies in our space, we’re not quite in that position yet. But some companies in our space are willing to go negative on the front end because they have the continuity, they have the back end revenue, because that back end revenue margin is 75% or greater, and they can either have people on the continuity for the same product they initially came in with, or cross sell them into other products as they develop them down the road. James: And they’re building a big house list to build that. So just to explain that to our listener, that means some companies are prepared to literally give away the front end of the profit so they can afford to sell the product at what it cost them or even charge a little less than what it cost them just to get someone hooked up to the system and over time the profit will come in the repeat sales on average. James: Now I remember from a few discussions ago that we had, you had a pretty good focus on the sales copy. While we’re talking about the front end, how does one go about building this business, you know, if there were just a few fundamentals, would you say that copywriting would be one of the big ones; the front end marketing is probably one of the biggest challenges for new people? Buck: Yeah, absolutely. I mean I think it’s the same for, because I’m in the direct response world, that’s how I sell my product online, and it’s the same whether you’re selling a dietary supplement or an information product. The big difference really is compliance. I know that there are rules and regs as it relates to selling business opportunities and things like that, certainly. For example, I’m an American, obviously, but for Americans we have something called the DSHEA Act, which was passed in 1994, that gives us pretty free access to dietary supplements. And it’s made for a relatively unregulated industry in the US. It’s relatively easy to get products manufactured and promoted, as long as we adhere to some specific rules about not making what’s called “unsubstantiated health claims”. So as long as you follow those rules, you have someone review the claims that you’re making in your copy, you can go through the same kinds of persuasion architecture that James, I’m sure you’ve taught. You speak to your audience about the same books that are read for selling infoproducts. We read Breakthrough Advertising, or The Ultimate Sales Letter by Dan Kennedy, or some of these models for creating sales letters and video sales letters. We use all of that for selling supplements, with a twist. You know, some nuances of making sure we’re compliant, we’re not making any unsubstantiated claims. There are some tricks to the trade in terms of featuring certain elements of the product; the ingredients in the product and what it does for people so that they get super excited about purchasing the supplement and taking it again and again. Your own platform or others? James: Right. So in terms of this direct response, are you running these from your own website, or are you using other people’s marketplaces? Buck: Yeah, that’s a great question. A bunch of my students were running in Amazon. You know, Amazon’s obviously a huge retail spot, and a lot of folks are building businesses in Amazon. The issue with that is you’re really beholden to one sales channel, and for all intents and purposes they really control the sales channel. They control the channel, they control the customer. And so what we do is we use direct response. We bring the traffic to our own site, we control the property, we control the sales funnel end to end, and we “own the customer”. So we have the full customer record, the email address, the phone number, we have the ability to remarket to that customer, whether they’re a prospect or a customer, via display advertising, email marketing or telephone marketing, without restriction. If you look at things like Amazon, for example, if you’re selling in Amazon, you would be under some kind of restriction of how many times you could contact the customer, and the things that you could say, for example. James: Love it. It fits well with my idea of owning the racecourse. James: I’m a big fan of owning the asset, and having that control and less compromise. I imagine you could also have a hybrid, where you’re using multiple marketplaces for some products. Buck: And it’s recommended, too. You can’t ignore how much revenue goes through Amazon or eBay. I don’t know if you came to the Titans’ event, but they had Guthy-Renker talking there, Greg Renker was there talking about how much revenue goes through Amazon and eBay. But the beauty is, when you’re buying your own media for a dietary supplement offer, for example, you’re creating all this awareness about your product, your brand, people go hunting for it. And then if you happen to have a store in Amazon or eBay, you start getting benefit from that, too, from that after effect. James: For educating the market. Great. OK, now obviously you can’t build a business of this size by yourself. Do you have an office sitting somewhere in the middle of Texas, or are you doing this virtual? Buck: I think you’d be very happy to hear that we’re doing this 100% virtual. We have three of us that own the business, so one of the partners is in New York City, I’m here in Boulder, two of us are here in Boulder, Colorado, and we have the rest of our team spread out around the world. It can be challenging, I guess, not to have everybody in one box, but it’s also exhilarating at the same time. I think it’s a grand experiment to build a business of this size and deliver world-class products, world-class customer support for those products, and have customers that just love us. But they have no idea that they’re being supported by an agent that’s in their pajamas working from home, for example. James: Well, that’s how we roll. James: I’m not even wearing a shirt right now. But the thing is, I’ve heard of large companies in the dating niche, running virtual. There’s, I think Basecamp, are mostly virtual in the software industry. I like the virtual model. I don’t think it was really possible 10 years ago or 20 years ago for sure. I like the freedom aspect of it, that you can be travelling, and obviously you have three partners in there and you’re all in different places. James: Unless you’re getting to the 30 mil mark. So I start to think about all the challenges. That must represent having three people running this behemoth. Do you take different parts of the business? You must get on well, to be doing this for so long. Buck: Yeah, it’s funny that you ask that, because that actually came up at a recent live event that I conducted. I recommend, part of my process when I hire people, James, you might do the same thing, is have your people do a personality test. And so we use the DISC test as a mechanism for gauging people’s personality types. And we, myself and my two partners, we all took sort of a high-end version of this test and we worked with a consultant to try to figure out what was broken in our marriage. And it was actually very smart that we did that, because instantly when we saw each other’s results, we realized, this is exactly who we are. We know why we’re this way, what our priorities are, and why we do the things that we do. It helped us understand each other, and we now are much more cooperative. We do divide and conquer on things. I happen to get into more strategy, copywriting and business development. One of my partners is very organized, is great at managing things day to day and managing people. And then another is also very strategic as well. So we’ve done a good division of labor that way. James: OK, so I also do the same with my managers, and with my SilverCircle customers. We do a profiling exercise so that I can actually help them more by fitting into their communication style. So, team. These people are scattered all around in their pajamas, what sort of…you know, this sounds like we’re going to have some things in common here, but what sort of systems are you using to run the business with this large team, to start with? Buck: Yeah, we’ve kind of narrowed in on just a handful of tools that really make it run day to day. Email and our applications are run on Google Apps, Gmail and Google Apps. For communications we use Skype and a product called Slack, which has been very popular here in the software startup community, S-L-A-C-K, for communication. It’s kind of like a threaded version of Skype. James: We use Slack, and I would describe it as a replacement for email. James: Incredible. We have 50 people, and it cut five hours of email off my week. Buck: Yeah, fantastic. And then on top of that we do kind of glue it all together, you know, you need some kind of project management solution, so we use Teamwork. I know there’s a few of them out there, Basecamp and other things, but Teamwork PM seems to work well for us. We get everybody together, we love video, so between Skype Video and Google Hangouts, that seems to work well for us to get some face time. James: It’s quite funny. No one in my business wants to use video. Very shy Filipinos. But I do a live meet-up every 12 weeks and we review our business. Do you meet face to face ever, physically? Buck: You know, I’m embarrassed to say, not the whole company. And when I come down under, I’m actually going to have my virtual assistant come up from the Philippines; Mark is going to join me. So no, I need to do that more, I’m jealous that you can do that hopefully relatively easily from Australia. James: Don’t be jealous, just do it. It’s not that far. You know, I’ve flown from Philippines to Los Angeles, and it’s really not that far. It’s only 10 hours versus eight to Sydney. So it’s really not that much different. The big difference, and I’ll acknowledge this, it’s way harder for you, timezone-wise, to be dealing with the Philippines than an Australian business. So we have got that tremendous advantage. Buck: You are so lucky, and I’ve got some students down under too, and I keep telling them that they are in a great position. James: It is a blessing; we’re only two to three hours apart. And I know, whenever I’ve traveled to the United States, I hear a lot of whining and moaning how difficult it is to deal with the Philippines, because they’re on such an awkward time zone. James: And you can’t really get the best out of someone at three in the morning. Buck: Well, I think there’s a little trick, you probably do the same thing. I do have folks that I’m more task-oriented in quality than I am about time availability. James: Oh, me, too. I don’t care what time of day they’re working, I just want my daily activity report. I know for a fact some of my people are travelling, and are in different places. But the whole point here is we’re really deconstructing this notion that to have a really big business, that you need to be having commercial premises somewhere with people inside it. And that’s what we’re talking about here, isn’t it? Buck: Yeah, and I think that there are ways now through the hiring of the right people, putting the right systems in place, and having these technologies to support the communication, that a lot of the headaches that some people might think, “Oh, I don’t want a big business because it’s a headache,” it dispels that myth. James: How many people do you need to run a business of your size? James: OK, that’s great. And tell me also, physical stock. How do you handle fulfillment? We’ve talked about the front end, we’ve talked about the marketing, the website, where the website is, they order something, they go on a database, something has to happen and then they’re actually going to get a physical bottle of pills or something, right? Buck: Right. Yeah, the beauty is, and this was true 10 years ago when I first started and it’s become much easier in recent years, is that the software economy that we’re in and the age that we’re in and how fast things are moving, is creating a very competitive environment when it comes to…. Contract manufacturing is still relatively stodgy, getting something manufactured by a quality manufacturer, they have good solutions to help with their quality assurance and so forth, and they use products like SAP to manage that process. On the fulfillment side, there are many options available here in the US that do an amazing job of getting the product into people’s hands. Sometimes they’re faster than even Amazon does, doing two days or less for a very low cost. And you can have them integrated with your shopping cart solution in real time fashion; have your orders go from your cart to your fulfillment center through their order warehouse management software. Order gets picked, packed, shipped to the customer, you get the order confirmation number, tracking number synced back to your shopping cart or CRM system, so that if they ever call up saying, “Hey, where’s my stuff?” your agent, who might be in the Philippines, can go look it up real quick and respond to them. James: Right, so it’s like a DHL package when you know where it’s heading. Buck: Mm hmm; so all that stuff you don’t have to own. In that case you don’t have to own the racetrack, or at least that part of the racetrack, is that you can work with great partners, you can shop and have different partners if you want to, and as you need to scale, like we’re looking at scaling to other countries, because the US market is such a massive market when it comes to selling dietary supplements. James: It is. It’s a great market. There’s hundreds of millions of people, and they’ve got a reasonably strong currency and they love to consume. Buck: Unfortunately, that’s true. Fortunately for us, but you know, even the Aussie market, for example the Aussie market’s strong for us too. James: Oh, we’re quite a buoyant market. We haven’t had the recession that everyone else had, so we’re fortunate in that regard, but there’s just not that many of us. Buck: I don’t know, if we’re on a per capita basis, you guys buy a lot of supplements, at least from us. James: Oh yeah, no doubt about it. We are a strong market for buying things. Like for AMG, for example, we’re in the top six countries in the world for consuming AMG Mercedes-Benz, even though they’re so expensive here. Buck: You have like a dozen of them, don’t you? James: I just keep one at a time. OK, so how do you find these people? Buck: Oh boy, I tell you, man; you could just do Google, and build a nine-figure business on Google alone. But the beauty is, you have Google Search and Google Display Network, Facebook, which has been on a tear, and the capabilities of Facebook to target based on interest and demographics and other aspects have been a huge boon for our business. And then these native ad platforms and we’re starting to branch out into DR Radio and other things, still leveraging online sales that give us all these other avenues to find customers. And we haven’t even scratched the surface because we’ve been primarily an online business and we’re now just starting to look at some offline acquisition as well. James: Right. Yeah, I wouldn’t be surprised if you’re sending out hard, actual letters in envelopes. Tell me, with regards to the house list, how important is that? Once you’ve got the customers, is that where you can generate a whole lot more profit? Buck: Are you giving me a softball there? Absolutely, yeah. James: Well, it’s something that I’m pretty passionate about. For the first few years, I really didn’t focus on building my list that much. But I would say that the core database that I have for my business is not big, I think there’s about 26,000 people, records, but that powers a multi-million dollar business annually. James: So I’m a big fan in looking after your prospects and customers, with some sort of system that allows you to have the right message to the right people at the right time, with a little bit of segmentation and customization. I want to make sure that when I send an email, it’s highly relevant. I suspect you probably have a pretty big list, and you sound like you’ve got lots of other fields too, to allow you to do extra things. Buck: Yeah, just a few weeks ago, we were very lucky to announce our 300,000th customer, paying customer, so we feel like we have this opportunity to touch a lot of lives. We think we can go to a million or more in relatively short order from here, which is a great feeling, because I see another aspect of this, I’m sure you have this with your business as well, is that you really feel like you’re making a difference. We can wake up in the morning and say, because we get an amazing amount of testimonials and customers, that we’ve made a dramatic impact on their health outcome through using our products. So that’s exciting for us. But in terms of how we manage the list, we can always do it better. It sounds like on a per subscriber or customer basis, you’re doing a lot better job than us, but we use platforms like a good CRM system like Ontraport to manage, we do email marketing of our new products that we launch, we do promotions and so forth. And because they come back and buy again and again, we assume that they’re pretty happy with us. We give storewide discounts, like for example over the Christmas holiday, and they came in and we had some of our largest, record-breaking revenue weekends as a result of doing that. James: Well, you know, the amount of things in common is spectacular. I think on a per employee basis, you’re doing quite well. But then if you factor in different margins, I reckon there’d be so many things in common that it’s crazy, we’ve completely different businesses. And that’s probably the encouraging thing to come out of this, and I am surprised about it. I was wondering if you’d be speaking alien to me, and what I found out, and if we just have a little recap of what we’ve talked about, and as we come closer to the end here, is that you’re doing this because it’s something that you felt you could have a good advantage in, you’re excited about the market. And also you feel like you’re able to help more people. That’s why I run an annual event for my own customers. 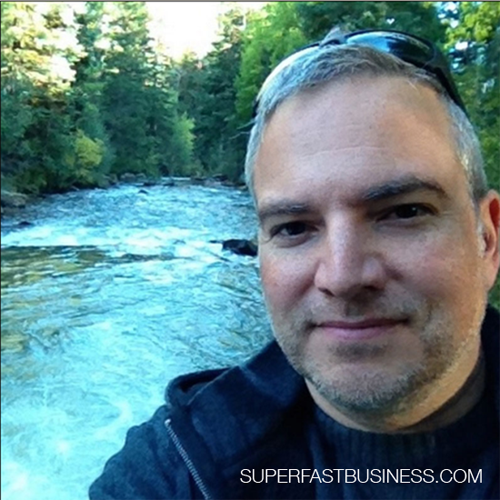 SuperFastBusiness Live is like the once-a-year big meet-up for my customers, that’s pretty much how we look at it. That’s why I’ve asked you to come and talk about this sort of stuff, because I want to share this idea. But what’s really come out of this that’s almost shocking to me, is that you’re running virtually a carbon copy of the tools and systems in terms of how you’re communicating with your staff, how you’re communicating with your customers, I’m using the exact same tool. James: Recurring, recurring, recurring is the key to having a decent business because if you have a recurring product, then you can afford to acquire that customer in the beginning and be able to look after them. And if you’re just selling onesies, not the suit, the little adult baby suit, I’m talking about one-time products, then that’s just a hard way to do business, isn’t it, compared to the way that we do it. Buck: I’ve just gotten excited all over again about my business, talking to you about it. James: I wasn’t really trying to diss your business model; I was just trying to understand it. Buck: I was joking, yeah. James: And I think common sense prevails here. If you can have a reasonable profit margin on a pretty big business in a massive market and you enjoy it and you’re helping people and you can pull it off, why not? And that’s really the outcome of this, so I’m looking forward to catching up with you face to face, because that’s another little takeaway from this. As much as we’re in an online world, when you go face to face, the real connections happen. That’s how we met, that’s how I build my team so strong, and that’s how my customers interact with each other at these live events. So Buck, thanks for sharing some eight-figure business insights with us, and I’m looking forward for us to dig a little bit deeper. I’ll field some questions from this podcast, and based on those questions we might be able to zoom in on some extra areas in our SuperFastBusiness Live event. Buck: Perfect. Thank you James, I can’t wait to come down there. James: Right. So that was Buck Rizvi from HealthProfitsAcademy.com, talking about how an eight-figure health business works, and I’m sure you’ll have got some clues there about what you might do if you were going to go into something like that. I would definitely recommend that you get professional help to avoid all of the mistakes and landmines that could possibly land you in a whole lot of hot water, unless you do it right. Comment below: Can you envision yourself running an eight figure a year business? Super high quality discussion. James – great interview. This business he is in is amazing, we have a client that is in this sector and you have to be innovative. Weight loss will always be in fashion with the glutton level USA consumer base.. selling the dream and keep them coming back, brilliant. The jury will always be out on the “real” impact, but for sure it has an amazing long term run and its up the consumer to “weigh in” as they vote with their wallet. Cheers to Buck for killing it, recurring revenue after all is the key.